TELawrence is a Legacy Library. Legacy libraries are the personal libraries of famous readers, entered by LibraryThing members from the Legacy Libraries group. » T. E. Lawrence's catalog. » T. E. Lawrence's legacy profile. TELawrence is also an author. 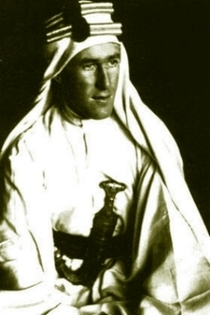 » See T. E. Lawrence's author page. About me"All men dream: but not equally. Those who dream by night in the dusty recesses of their minds wake in the day to find that it was vanity: but the dreamers of the day are dangerous men, for they may act their dream with open eyes, to make it possible. This I did. I meant to make a new nation, to restore a lost influence, to give twenty millions of Semites the foundation on which to build an inspired dream-palace of their national thoughts." I was born in what is now Gwynedd in Northern Wales on August 16th, 1888. I would receive my degree from Jesus College, Oxford in 1910 and would then begin my career as a practicing archaeologist in the Middle East. With the outbreak of World War One, I would eventually join the General List in October of 1914. With my extensive knowledge of the Ottoman Empire and the Arab people, I was assigned to work with Arab rebels to overthrow the Ottoman Empire from within and I earned several medals for my work. In 1923 I joined the Royal Tank Corps under the false name of T. E. Shaw, until I was able to join the Royal Air Force in 1925. However, in 1928 I was forced to return to England from my assignment in India, and I would die in England on May 19, 1935 at the age of 46 from a motorcycle accident. About my libraryA complete listing of the texts owned at the time of my death can be found in T. E. Lawrence by his Friends (London. Jonathan Cape, 1937).